A huge thank you to the Killer Characters ladies for hosting me! I’m a big fan of their books, so I’m thrilled to be here today. Hollywood Confessions follows how I investigate the death of a reality TV show producer in my capacity as a reporter for the L.A. Informer. But, sadly, I wasn’t always so brave in the face of dead bodies. Last year I was single and dating, and I met a very interesting guy. He was an ultimate fighter (Yeah, as in he beats people up in those cage matches on TV for a living. ), but honestly seemed way sweeter than you’d think a guy that knocks people senseless all day would be. We went out a couple times, had a great time, then one Friday night he asked me to meet him at his house to go out to dinner. I get to his place exactly on time and knock on the door. Nothing. I spy the bell and ring that. I wait. And wait. Finally his roommate answers and lets me in. I go down the hall to his bedroom and see that the door is open. I kinda knock and push my way in with a, “Hello?” The TV is on, but Fight Boy’s not there. So, I make myself at home, sit down, pick up one of his books to read, figuring he's in the shower or bathroom or something. I wait a few minutes. No sign of him. I’m feeling a little odd hanging out in his bedroom like this. I mean, I don’t know him that well. So, I get up, kinda peek around the rest of the house. He's not in the kitchen, living room, bathroom, or backyard. ‘K, weird. I go back to his bedroom and wait a few more minutes, grab the remote and change the channel (from Terminator to America's Next Top Model – hey , if I gotta wait around, I might as well be entertained doing it, right?). I watch TV for a few minutes. He still doesn't show. It's getting late now. Like, he's 20 minutes late. So that’s when I really start checking out his stuff. His keys are on the nightstand, so is his cell phone. He wouldn't leave the house without those, right? So where the heck is he? And that’s when things went from weird to freaky. I hear a noise from the closet. I look up and, I swear to heaven, a body part falls out. body in there (beyond creepy!). I wait in the kitchen, letting my pulse return to normal (and giving anyone hiding in there a chance to get out and slink away), then slowly go back in his room. Yup, the knee is still there. Sticking out of the closet. Not moving at all. This is where I proved that my reporter skills needed a bigger shot of bravery. AA braver reporter would have investigated. She would have peeked in the closet, found out who the knee was attached to, why they were there, if they were, in fact, alive. Me? I grab my purse and bolt. Hit the front door, run to my car, lock the doors, peel out of there so fast I burn rubber, and drive straight home. Needless to say, that was the end of me and Fight Boy. He called me later (in fact he called about twenty times in a row, prompting me to shut off my phone), but honestly, there was no explanation that would ever have made me go back there. The best I can think of is that he somehow passed out in his own closet. That's best case scenario. Worst case… my fingerprints were all over a crime scene. To celebrate the release of Hollywood Confessions, today I’m giving away the opportunity for one lucky winner to appear with me in my next adventure! Just post a comment below, and you are entered to win a cameo appearance in my next book. (And together we can both be braver!) I’ll pick a winner at the end of the day and post her/his name at the end of the comments! Wow, Gemma...life is not dull for you, is it? Good luck with this next adventure...and with the dating thing. I'm pretty impressed that you didn't open the door! Running was the wiser thing to do, but now I want you to go back and find out what was in that closet! Do you promise that, in the cameo, I don't find a body, or part? ps: Link to your website doesn't work. Liz - re link: doh! Try cut and paste? Sorry about that! I would hate to find a body part anywhere, much less at my boyfriend's apartment. I don't blame you for turning off your phone! 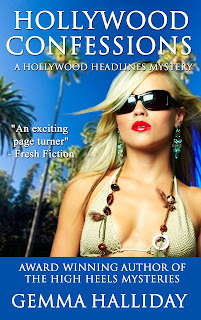 Hollywood Confessions sounds like an exciting read! Yep, any of the three options would be creepy.....he's hiding the whole time, he hid because of what he had been doing, or he's dead. Creepy indeed! But, makes for a FUN story!!! Eeep. Note to self: stay away from closets among other things. Good luck all round and thanks for coming by Killer Characters. And the winner of a cameo appearance in my next book is... Linda McDonald! Linda, email me at gemmahalliday at gmail dot com for details about your prize. Congrats!